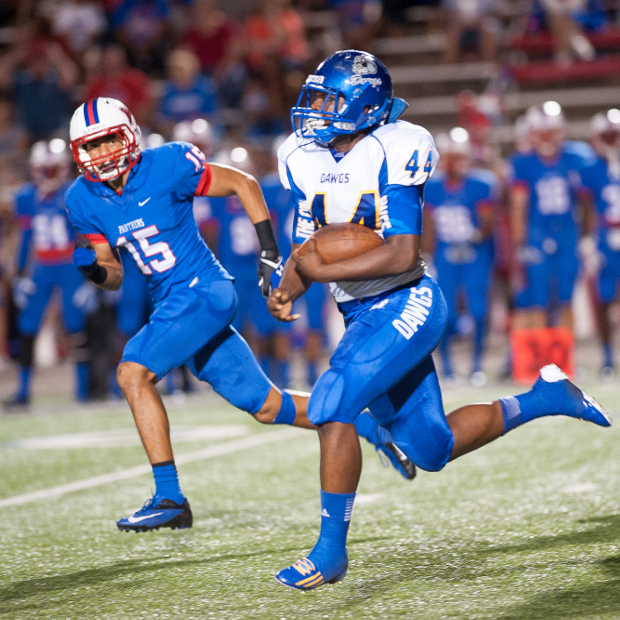 HEWITT, TX – The battle of the top two offenses in District 8-5A came down to special teams as Copperas Cove’s Jayson Stanley missed a 42 yard field goal in overtime and Midway escaped with a 42-39 win over the Bulldawgs at Panther Stadium in Hewitt on Friday night. Shaq Fluelen scores Cove’s first touchdown. Copperas Cove, the top offense in District 8-5A, erased a 32-10 halftime lead by the Panthers and forced overtime when Cove junior quarterback Manny Harris connected on a 7 yard touchdown pass to senior wide receiver Hunter McVeigh with 18 seconds left to tie the game at 39. “We don’t play for moral victories, we play to win the game, ” Copperas Cove head coach Jack Welch told HOT Sports Net’s Danielle Ehlert at halftime. The Panthers got the ball first in overtime and moved to the Bulldawgs’ 7 yard line when sophomore running back Eric Clayburn ran from the 25 to the 14 and a Bulldawgs face mask penalty moved Midway inside the 10 yard line. But the Panthers drive stalled and senior kicker Leo Peralta booted a 26-yard field goal for a 42-39 lead. The Bulldawg offense then had their shot in overtime but went three and out after 3 straight pass attempts from Harris. Bulldawgs senior kicker Stanley lined up for the 42-yard field goal attempt, but it went far right. Harris, finished with 419 yards passing and broke Robert Griffin III’s single season passing record in only his sixth varsity game. Harris was 37 for 61 passing with 2 touchdowns and added 54 rushing yards. Senior fullback Shaq Fluelen rushed for 97 yards on 12 carries and 3 touchdowns. Senior wide receiver Philip Baptiste caught 14 passes for 164 yards and McVeigh added 113 yards on 10 catches. Senior linebacker Elijah Timarky led the Bulldawgs defense with 13.5 tackles including 3 sacks and Spencer Malchow added 9 tackles. Junior quarterback Ben Hicks led the Midway offense with 337 passing yards on 21 for 34 passing and a touchdown, he added 23 rushing yards on 15 carries and a score. Clayburn had 124 rushing yards on 20 carries and 2 scores. 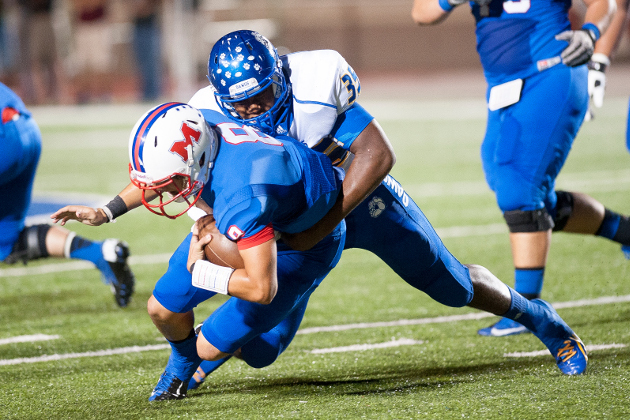 Midway is now the lone undefeated team in District 8-5A at 3-0 and 5-1 overall and travels to Killeen on October 18. 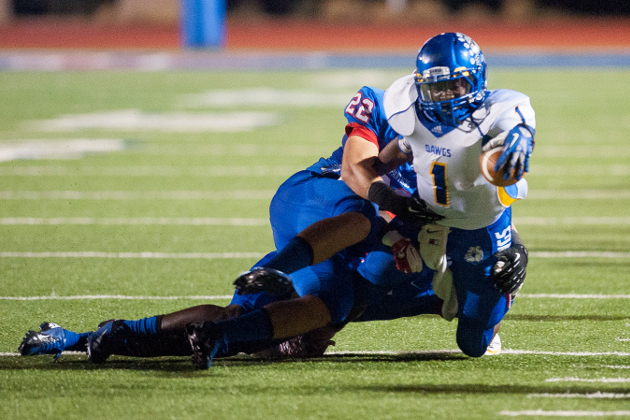 Copperas Cove falls to 1-2 in District 8-5A and 3-3 overall and will host Belton next Friday.